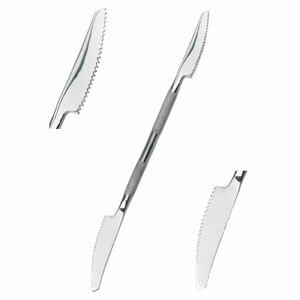 Our SP-37 is a dual ended serrated chrome spatula designed for Plastilina and wax modeling. Both ends are knife-shaped with the lower curved side having teeth for texturing and the upper straight side for cutting and detailing. The sweep of the curved sides is shallow; the teeth are medium grade. A perfect tool when working on an area that has reverse angles otherwise difficult to sculpt.